DrawMe 5 out of 5 based on 2 ratings. 2 user reviews. You made the party and everyone loved your talent. We will definitely think of you for future events. Thank you! You made a wonderful accent to our party. Thank you so much! Everyone was raving about the work you did! Fantastic. The party was a hit and I'm so happy we had you there to boost the excitement. It worked out wonderfully! Thank you again for your work at our staff and family picnic yesterday. You were a highlight of the event! ... It was a great party and you played a large part in its success. I will recommend you to all my friends and acquaintances... Thank you for your fine work. for drawing at our wedding. You were an absolute hit! around, even after hours (and hours!) of working ... The entire day was magical and you were the icing on the cake (wedding cake, that is). "Rhiannon dancing" and I know she means the picture. It is beautiful and really looks like her!! You made the party and everyone loved your talent. We will definitely think of you for future events. I want to tell you something that happened last week. An older man that was at (our) party died last Tuesday from a brain aneurism. It was sudden and we were all shocked. 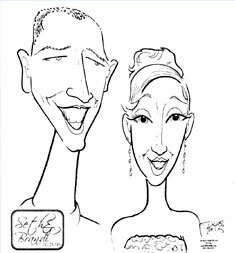 You drew his caricature and his wife. They have been married only 18 months...They had your drawing displayed at the funeral. It brought a smile to my face and I am so glad we have those happy memories. You just never know when your last day will be... 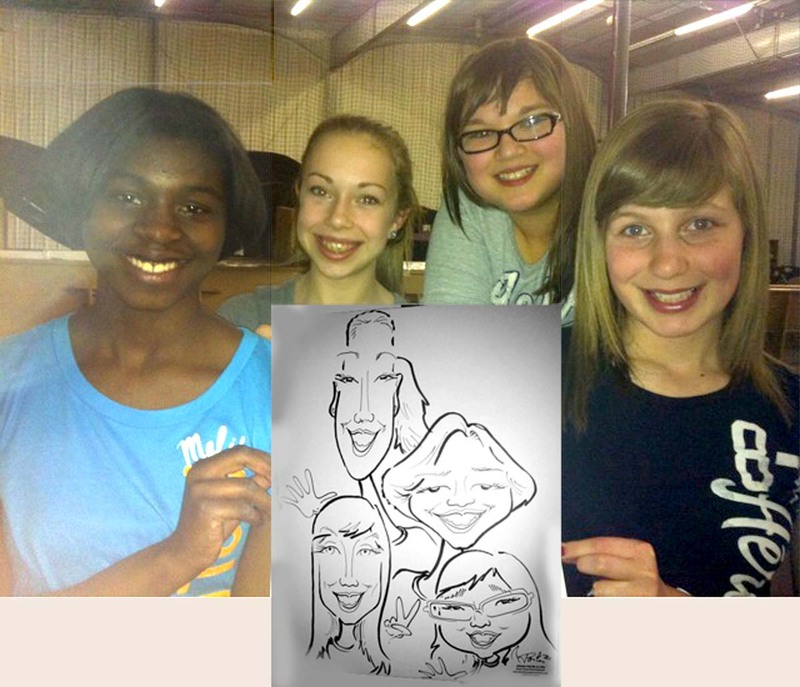 Attached is a pic of the drawing taken at the party. His name was R-- and wife C------. Got your nice thank you note. You are a true professional. We definitely will be in touch for future engagements, as everyone thoroughly enjoyed your work and personality. I just wanted to say Thank You so much for the caricature you made of me a couple weeks ago at the (theatre) screening. I had no idea you were doing that... I have placed it as my profile picture on my page! Thank you again and hope you and your family enjoyed the movie! Thank you for adding such a fun element to our party! Your talent and creativity are really amazing. We are glad you entertained us. I just wanted to say thank you so much for helping make our spring break event such a success! Everyone seemed to have a great time, and it went even better than I expected. I really appreciate all of the hard work that you put into everything. It was really great working with you, and if we ever need a caricature artist again for anything at Xavier, we will definitely give you a call! Thank you so much for the drawings on Katie's special day. It was great fun and we had a lot of great comments and feedback. Thank you for the drawing of my daughter that you did for a birthday party at (her) preschool. She was so excited to have it and insisted on hanging it in the house at her level so she can see it often. It is beautiful and really looks like her!! Thank you!! Hey, I just had to write and thank you. The picture is exactly what I wanted to the last detail and she will just love it to pieces. 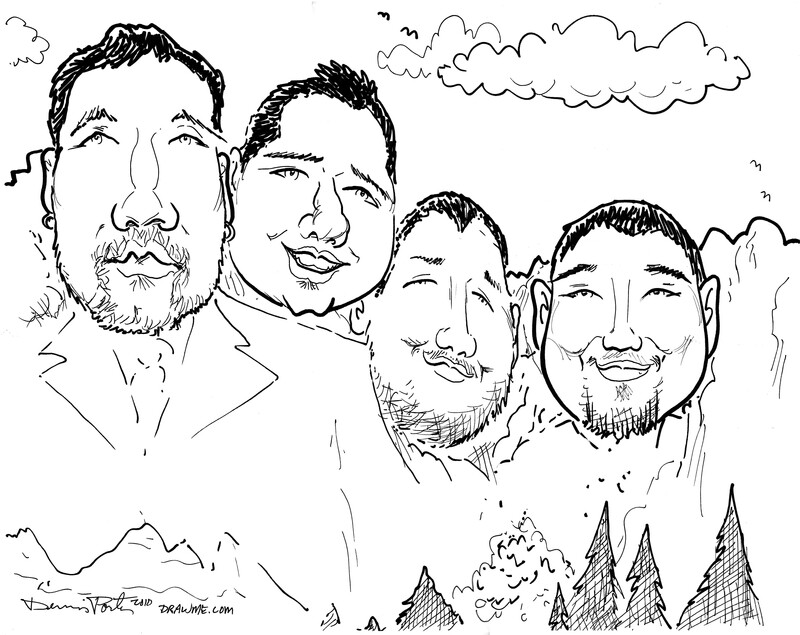 Really I can't thank you enough for the caricature. You did a great job, especially considering the time constraints, working from pictures, and my typed out instructions. Everyone's picture was great, they turned out wonderful and they were a huge success... thank you once again for the outstanding work and your (and your wife's) patience through this process. Thank you so much the picture is amazing. Thank you so much for your hard work and time, we are very happy with the pictures they are amazing. We appreciate how fast you got them to us and will definitely keep your information for any other work we want done and recommend you to anyone else who may want some pictures, thank you again. I passed out all the cards you gave me. We will definitely recommend you to others. and the drawings were amazing.